Today was insane. Brian and I woke up before Patrick, a rare occasion, and were lying in bed talking (we’ve missed each other) when the power went out. And then, a few minutes later we heard sirens. And, well, we hoped it wasn’t but we suspected that a car accident had knocked out the power. We live in a quiet neighborhood, but it’s near some busy streets. And this morning, somehow a traffic accident took down two power poles. Across the street form each other. The power was out all day. Not the smoothest start, but we pushed on. It was a big and busy day and I needed to make the most of it. So, after sending Daddy off to work, Patrick and I got ready to go do a little more shopping. We still needed some things for school to start. And then we hurried home to meet my sister. i ended up with 3 big things scheduled today. An allergist appointment, a school meeting, and a speech evaluation. My sister Marcy agreed to tag along for the day to help keep Patrick happy while I did the talking that needed to be done. Patrick doesn’t like us to talk about him. Well, we got to the allergist and went to check in and they couldn’t find the appointment. Finally they looked it up and told me that it wasn’t until the following day. I explained that I had come at the time told to me and that I couldn’t come the next day because Patrick was in school. They tried to find a way to fit us in.. but with other meetings we couldn’t swing it. I was disappointed because i really want help sorting out these new allergy test results. They revealed new allergies. They also hint that Patrick might be outgrowing his milk allergy. And I don’t know what comes next. But it had to wait for another day. We went and grabbed lunch and then headed to a park. Patrick was seeming restless. But we sat down to eat only to discover that Arby’s had put cheese on Patrick’s roast beef sandwich. And with no answers from the allergist, I had to pick out the pieces he could eat. Frustrating. Anyway – Patrick made a friend and the time at the park was fun enough. And then we went off to meet with the school. I can’t really describe what school meetings for Patrick look like. This one was packed. We had the teacher, OT, PT, principal, nurse, district special education liason, and two other very big district big wigs over special accommodations in the school. Plus Patrick, me and Marcy. When I talked to the nurse, again, when we started talking about medical needs he said that it sounded like we didn’t have enough support. I told him that we had been promised extra help from an aide and I didn’t know how to make that happen. I gave him some names that I had of people who had made decision and promises. And he said he’d make some calls. Yesterday morning, I got a call from the district nurse who was helping with Patrick’s school transition. She explained to met that, in fact, she had helped request an aide for Patrick and told me the language to use to make sure that one was provided. And she promised to call around and find specifics. And so today we sat down and i started to go over Patrick’s needs and I brought up the concern that there wasn’t enough support in the classroom… and the district special resources person told the principal that they had 22 extra aide hours per week for Patrick. Her response was a mix of frustration and relief. Glad for the resources but not so much for needing to produce this extra employee for school to start the next morning. I can’t blame her for being upset. I’m upset that it took a meeting when I’ve been asking about it for a month. But I’m also partly to blame for taking so long to choose a school. We went over medical needs. The nurse was really outspoken and trying his best to help. We talked about where Patrick should sit and lunch. (End of the table with friends with safe lunches next to him.) We decided we needed to set a time to train the classroom staff. Only with school starting, he didn’t think we could fit that in right away. We decided to let Patrick come 10 minutes late to school and miss breakfast. I explained that hands have to be washed with soap and water, not just hand sanitizer which created a fuss about the bathrooms always being out of soap. I offered to provide soap for the classroom. And the district rep jumped in and said I couldn’t do that and promised to remedy the situation. We talked about potty training. That was one of the teacher’s biggest worries. I don’t blame her. It’s a huge time commitment. Especially with Patrick. I guess there are two kids potty training which makes things even more complicated. Also, the private bathroom I was excited about turns out to be in the school’s “sick room.” I was SO grateful when someone else spoke up and said that wouldn’t work. Not sure that we actually ended up with a resolution, though. They talked about making the school move the sick room. They talked about offering to install a changing table in the bathrooms that are being remodeled, too. We decided to let Patrick wear pull-ups to school while we work it out. We planned to hold a new IEP meeting in October, once they’ve had a month to get to know Patrick. And we talked about including or re-including some new things at that time like restarting physical therapy and calling in the augmentative team to look at some assistive technology for writing. And then, after we talked about everything that needs to be done.. the idea was thrown out that Patrick maybe would be better off if he didn’t start school tomorrow. I didn’t know if i was relieved or crushed by that idea. Really, they aren’t ready. Really, I’m not ready. I have felt like I have been only halfway there this year. Not put together. Not giving him time to transition after all the craziness of travel. And so a few more days will let me make his backpack and his lunchbox cute and medical friendly. It will let me train the staff. It will let them try to hire help. It might give me time to figure out this new allergy questions. And to get Patrick back into a routine with eating and potty. It will let Patrick and I have a few more days at home to say goodbye to each other. And to really get him ready for the idea of school. But I’m kind of sad. It feels kind of like when you’re on a road trip and you finally make it to a rest stop only to find out that the bathroom is closed and you’re gonna have to cross the street to the gas station. It’s only a little further, but it’s the longest, hardest part of the wait. I look around and see so many things that have just been waiting for me to get to them. And they will need to keep waiting. I feel really bad for Patrick, too. On Sunday, all the other kids will be talking about starting school. And he will have been left a home. Again. He will miss the craziness of the first day of school. But he’ll have missed the specialness of it, too. He’ll be the different kid. The one who came late. The new kid. Again. They asked if I’d like to come teach the kids about his allergies and immune suppression. I told them about the presentation I gave last year at the start of kindergarten. And I could see they liked the idea. So on Friday afternoon, I’ll be going in to introduce Patrick to his class. And then afterwards, we’ll meet and go over a behavior plan and schedule. And then Monday morning, he’ll start school. I’ll stay and help the nurse train the teachers. And I’ll maybe stay to help a little more than that if they don’t have another aide by then. And I know it’ll be good. I think I’m just a little bit mourning normal. I want back to school to be exciting and happy. This just feels complicated. But maybe having a few more days to regroup will accomplish that. And meanwhile, we have one last week with the girl who’s been doing Patrick’s respite. And we have a few sweet days where all the kids are in school and we might be able to sneak off and do something awesome without a crowd. This entry was posted in Life as an SBS mom, School and tagged 1st grade, 504 plan, accommodations, back to school, food allergies at school, Granite School District, IEP, school medical plan, school nurses, school placement, special education on August 19, 2015 by geekino. Well, as I mentioned in my last post, Patrick has started the extended school year program. Extended school year is a funny thing in our neck of the woods. I don’t know if it works like this everywhere, but Utah has such large families and our school district is one of the most established and biggest in the state so they are very efficient in what they do.. that, well, here you don’t get extended school year in your IEP unless you have a really darn good reason for it. I’ve tried in years past and was told that it really is reserved for children whose disabilities are so severe that they wouldn’t make much progress elsewhere. I didn’t even imagine what that meant until this last week when I dropped Patrick off in his class. Patrick was placed in the amazing medical school in our district for the summer because he is still so newly post-transplant. Unlike the school that he’s been attending which serves children with medical needs but also the local community, Hartvigsen is a dedicated medical school for the district’s most severely disabled students. What an undertaking! There are at least a dozen buses that bring students to this school. Their teachers and aides meet them and bring them to class. There may be fewer than a dozen crazy parents like me dropping their children off at school. (I prefer to do this anyway, but really had no choice if transplant medications were going to be given exactly as ordered and on time.) I was instructed to walk Patrick into his classroom. His teacher was excitedly waiting. It’s possible he was the only student added to that class for the summer. He was also the only student who was verbal and not in a wheelchair. I took a deep breath, a leap of faith, and kissed him goodbye. Meanwhile, I headed over to the office for a meeting I’d scheduled with the district representative to talk about my concerns for his placement in 1st grade. The buses were late, so my meeting was late. And I got to sit and watch the students and teachers some into the school. And I saw Patrick come meet the office staff. He was very happy. Now, about the meeting.. I know in my heart that he’s too behind right now to be comfortable just starting in a 1st grade class. But I also have just felt unsettled about the class they proposed putting him into. So – we talked about it. She was amazing to listen to my concerns and express solutions. I told her that I am incredibly worried about him not being challenged if he’s only taught the goals that we come up with for an IEP. That he often surprises us by mastering things beyond the skills we think he’s stuck on. Sure, he’s struggling writing his name, for example, but I discovered that he can write about 60% of the rest of the alphabet with reasonable approximation. I’m also very worried about him socially. I know that he behaves best, learns best, participates best and is happiest when he has friends. And so I’m worried that placing him in a class where he doesn’t have typical peers to socialize with. And as I expressed these concerns, the woman I was meeting with mentioned that she wondered if he’d do better in a different self-contained classroom. They’d suggested that he be placed in a lower functioning classroom because of low IQ test scores. However, she said, there was another class where the students were closer to normal functioning, the class followed more of a typical class schedule, etc. She tried to describe the difference to me, and then offered to take me to tour the schools and classrooms (albeit without teachers or students) in a couple of days. Tuesday, I had a much delayed appointment with the oral surgeon who helps keep me from grinding my teeth to bits and causing crippling migraines. So Wednesday was the next day I could. Meanwhile, Tuesday I happened into a couple of conversations that proved good reconnaissance on this issue. For one thing, Patrick’s home hospital teacher, who he has clicked so well with and learned so well from, called to check in. When I mentioned the choice of classrooms, she didn’t falter. She said that hands down, the first placement we had been offered was too low-functioning for Patrick’s abilities. She offered to call around to some of her contacts in the district and then get back to me. And she did.. giving me some names and some specific behavioral strategies that she thought I should have put into Patrick’s IEP to help him. She hinted that she thought he should get into a typical classroom as quickly as possible, too, which made me falter a bit in my thinking. Then, that evening, I had the chance to talk to a friend of mine whose son with autism is just finishing his 6th grade year in the higher of the two programs we had talked about. She only had good things to say about his experience at the school and we had a really good conversation about transitions and self-contained classrooms. It helped a ton. I went into Wednesday morning pretty confident about what I wanted. We toured the lower classrooms first. The school was beautiful. I loved the layout of the classrooms. It’s only 5 minutes from home. And as we stood there, I told her that I was hearing from the teacher who has had the best results with Patrick that she didn’t think he belonged there. Then we drove out to the other school. The one that sounded like the best fit. It was a long drive and kind of hidden in the middle of a windy-road subdivision. I didn’t love the classroom. At the second school, the self-contained classrooms are in portable classrooms, a.k.a. relocatables. The room seemed run down and bare. I could imagine Patrick cowering at the sound of rain on the roof. The classroom had steep aluminum steps and the nearest bathroom is inside the school building and I could just imagine Patrick having to go up and down them in the snow to go to the bathroom every couple of hours. The custodian was very helpful, answering questions about where the kids line up, where the buses arrive, and even the morning routine. He pointed out that they have a breakfast program where all the kids eat a district-provided lunch at their desks. Most parents would be thrilled. With food allergies and oral aversion and new transplant, I’ve been worried sick about lunch. Two meals at school, and one in the classroom, really bothered me. I’d mention concerns, and my guide would do her best to offer accommodations they could offer to make things work. And I found myself saying, well, we’ll have to do this or that and make it work. Still as we were leaving, my district representative asked me if I wanted to just start planning for Patrick to attend the more advanced classroom in the second school.. and I told her I needed to talk to my husband and Patrick’s therapist and get back to her. I think I know that Patrick needs a higher functioning classroom. But I so wish that I could have him closer to home in a beautiful classroom in a school that used to be the medical hub so they are wonderful at medical inclusion. And I don’t know for sure what to do about these worries. Or if I can really do anything in the middle of summer. They tell me we can move him if we pick one school and it doesn’t work. I hate the idea of him being continually bounced around. Meanwhile, after a week in his extended school year classroom at Hartvigsen, the principal called my helpful district representative and asked me if I’d consider moving him into a higher functioning classroom. And when I picked Patrick up Wednesday, they brought me all of his school medical supplies again. He’ll be moving to a new classroom at the school immediately next door to Hartvigsen called Plymouth Elementary. They have one class there. It has 7 students of all grades. But I’ve seen them. (They were waiting for a late bus while I was waiting for my meeting Monday) and he will fit in better there. And learn better there. He keeps asking me if his new friends will have wheelchairs. And he’ll still get to swim on Wednesdays. This entry was posted in Life as an SBS mom, School and tagged 1st grade, extended school year, food allergies at school, Granite School District, school placement, summer school on June 21, 2015 by geekino. 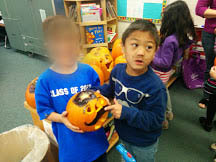 This picture was taken 6 months ago at Pumpkin and Mustache Day in Patrick’s kindergarten class. I didn’t know it then, but the Halloween parade and party the next day would also be his last day of school. 6 months ago, I tucked him into bed and then I went and wrapped up his birthday presents and I went to bed, but before I fell asleep my phone rang and our lives changed forever. I dare say, at least as far as I can judge right now, for the better. Today, I had an IEP meeting with Patrick’s school. Can I tell you what an amazing school he is in? They were completely behind me asking for a slow transition back into regular school. In fact, they were good with just about everything I asked them to consider. This meeting was amazing! Here’s the gist of things. There is a month left of school and Patrick’s immune suppression goals have been adjusted down because it’s been long enough since transplant to try. And the transplant team said that about this time we ought to consider starting to ease him back into the normal life that they did the transplant to hopefully give to him. So, after a very thorough discussion today, the decision was made to start letting Patrick attend school for an hour each school day. He’ll attend the last hour of every day. He’ll spend the first half of that time working with a special education teacher to help him to make up as much ground as possible. And then he’ll spend the last half of the day with his kindergarten class so that he can work on relearning the classroom routine and social skills. Also, once a week, I’ll bring him in a little early so that he can spend time in occupational therapy as well rebuilding his strength, working on writing and other fine motor skills, practicing eating, and so forth. Because he’ll only be in school part time, he’ll also still qualify to work with his in-home teacher. And, when the school year is done, he’ll take a short break, and then get to participate in the extended school year (or summer school) program this year at another medical school that is actually even a bit closer to our home. The mood in this meeting was so positive. I genuinely believe that this team is happy that Patrick gets to come back to school and eager to help him succeed in every way that they can. How many people come out of an IEP meeting saying that? That doesn’t mean that his IEP meetings aren’t still intense. There is a lot to coordinate and I am constantly amazed at the efficiency with which they run these meetings. (Also, with their stamina to do so many back to back to back at this time of year. They had already done several that morning with several more to go.) We made plans for how to drop Patrick off and what to do if classmates are sick and an aide to be with him in the classroom and what physical activities he can participate in and what to do when he needs to stay home and how to make sure that he gets the absolute most bang for the buck out of his hour a day at school. For the rest of this school year, they’ll be reimplementing the amazing IEP that they wrote for him the week of his transplant. Then we will reconvene in a month to figure out where he is on his goals and what the best plan for school next fall will be. The most amazing part? I thought we’d be waiting a week or two more for medication changes but the team in Nebraska says that because he kept swinging too high, they brought his dose down and he’s already there. That doesn’t mean he’s not immunocompromised. But this is about the best it’s gonna get for a while and so we might as well let him live. And then on Monday, Patrick starts school. I’m trying to wrap my mind around gathering all of the supplies, emergency plans, paperwork and other little details I need to have ready by Monday at 10:45 a.m. I’m hoping this is as good of an idea as it sounds. That he has the strength. That he can stay healthy. It’s strange to think that a month ago, I answered a phone call and our lives stopped and reset. And now, 6 months later..to the day.. we’re trying to kickstart life again. Patrick is bouncing off the walls excited. This entry was posted in Recovery, School and tagged Granite School District, growing up, IEP, immune suppression, intestinal transplant, kindergarten, multivisceral transplant, recovery, school medical plan, special needs parenting, transplant, transplant anniversary on April 30, 2015 by geekino.